coming aware of the differences between the two languages. learner’s mind where the learner’s interlanguage is constructed. understanding about how language learning takes place. the teacher and the learner is essential for successful learning. Language transfer is one of the main causes of Chinglish. student and peer in te raction. dix for the interview questions). 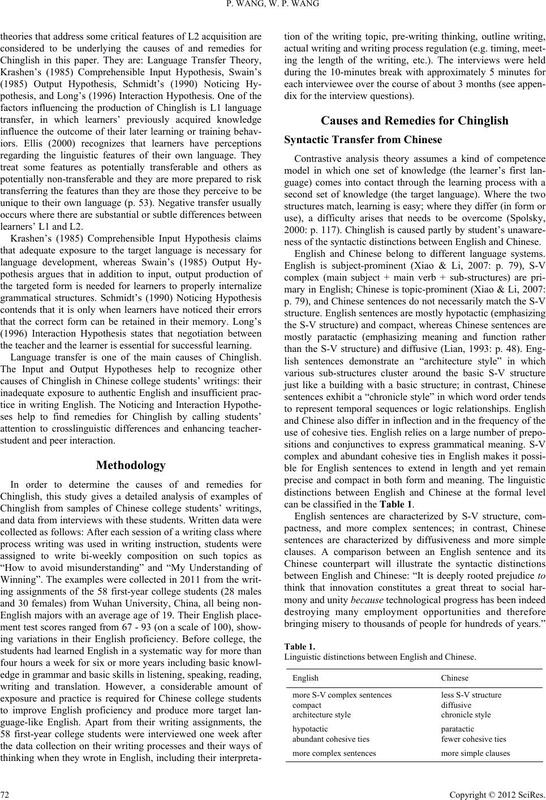 ness of the syntactic distinctions between English and Chinese. English and Chinese belong to different language systems. can be classified in the Table 1. Linguistic distinctions between English and Chinese. as it contains five clauses. they think into English without consideration of English syntax. of Chinese syntax due to lack of knowledge of English syntax. (1) a) My hometown is Xianghuan City. It has ancient walls. strategy in their Engl ish wri ti ngs. they have become a part of our culture. guages we speak or the beliefs we accept. clauses, arranged according to the Chinese way of thinking. Distinction between the English and Chinese sentence structure. sentence, and then put it in English sentence structure (p. 58). adjust the sentence according to English S-V structure. proach to involve children in decision making because…”. reduce Chinglish caused by syntactic transfer from Chinese. cause of Chinglish for the Chinese college students. should be thrifty at the same time. country is still in the stage of development. Chinese and western thought patterns. whereas westerners prefer objective thinking (Bao, 2001: pp. (a) I suddenly got a good idea. (b) A good idea suddenly occurred to (struck) me. nese” (Liu, 2006: p. 498). 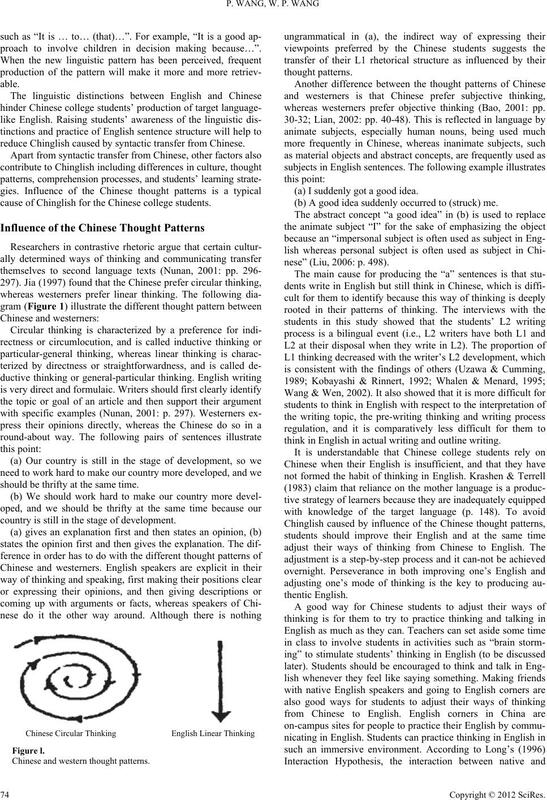 think in English in actual writing and outline writing. when they need to write. insufficient practice in English writing. ficient English competence is another cause of Chinglish. (a) Smoking is harmful to your body. (b) Smoking is harmful to your health. In (a), the use of “body” is a direct translation from Chinese. pragmatic effect when it comes to the choice of a proper word. (a) My tire of the wheel became broken on the way. (b) I got a flat tire on the way. ary (Longman Dictionary of Contemporary English, 1998: p.
in the following pairs of sentences. force themselves to do things out of their ability. pressure, college students shouldn’t push themselves too hard. characteristic phrases at the expense of idiomatic collocations. students’ knowledge concerning vocabulary and collocation. acquire more useful vocabulary and collocations. Language and culture are closely related with each other. 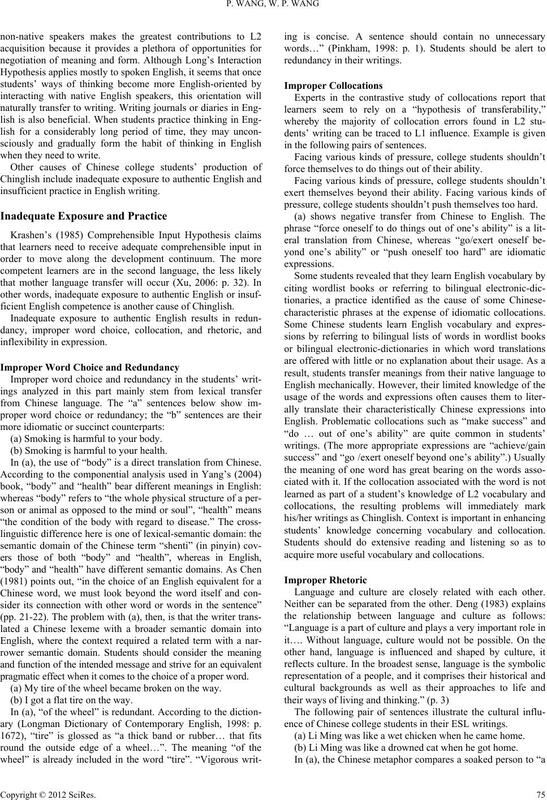 ence of Chinese college students in their ESL writings. (a) Li Ming was like a wet chicken when he came home. (b) Li Ming was like a drowned cat when he got home. target language in order to convey meaning successfully. or a lack of change with respect to habitual thought patterns. workers to get a job again. reemployment of the laid-off workers. (a) When you don’t feel well, you can go out travelling. (b) Travel can make you fresh and delighted. makes the English sentence neat and expressive. into English will help reduce Chinglish. frequently in their listening and reading. words and expressions in a variety of meaningful contexts. Chinglish to simply increase exposure to authentic English. necessary for learners’ internalization of the language. be grouped into three steps: preparation, writing and checking. a stream-of-consciousness fashion” (Clausen, 1987: p. 7). (1) a) Curiosity made me want to open the box. (1) b) Curiosity drove me to open the box. students to read and imitate can also help students to write well. valuable suggestions on my paper. University for their cooperation and contribution. Language Teaching and Research P r e ss. Cook,V. (1991). Second language learning and language teaching. London, UK: Edward Arno ld. guage Teaching and Research P ress . second language acquisition? 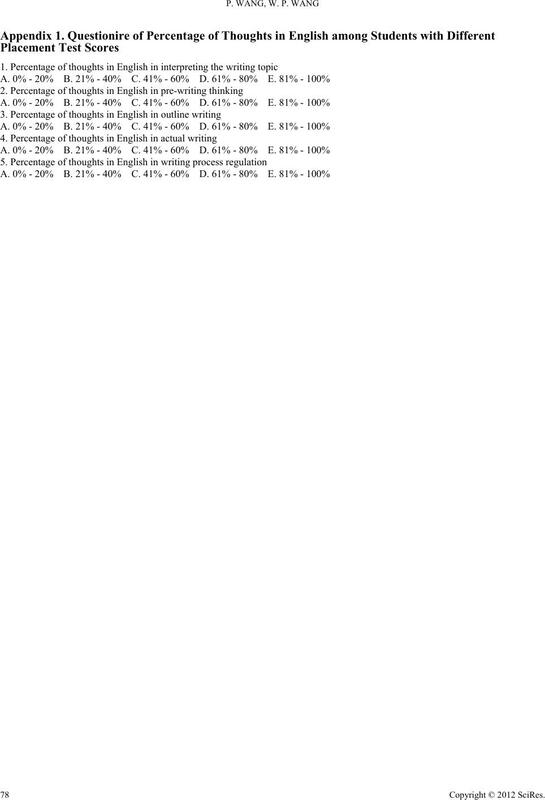 TESOL Q ua r te r l y, 34, 239-278.
don, UK: Longman Publishing Press. Language and Teaching, 2, 40-48. Liu, M. (2006). Comparison of English and Chinese and translation. Beijing: China Translation Publishing Press. lish-C h in es e ). Beijing: Commercial Press. Foreign Language Teaching and Re s e arch Press. 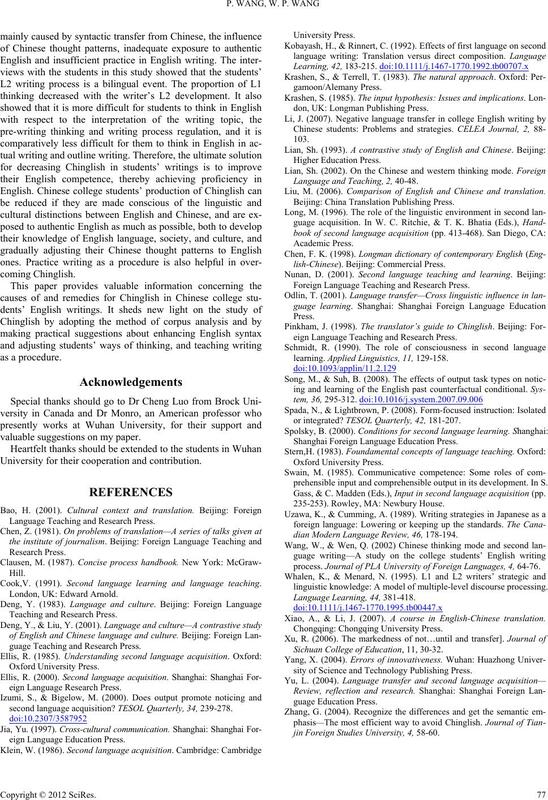 eign Language Teaching and Research Press. learning. 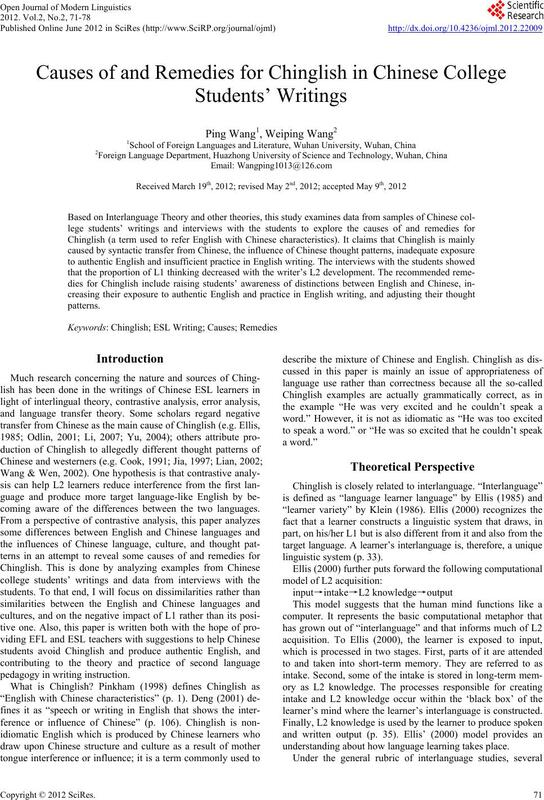 Applied Linguistics, 11, 129-158.
or integrated? 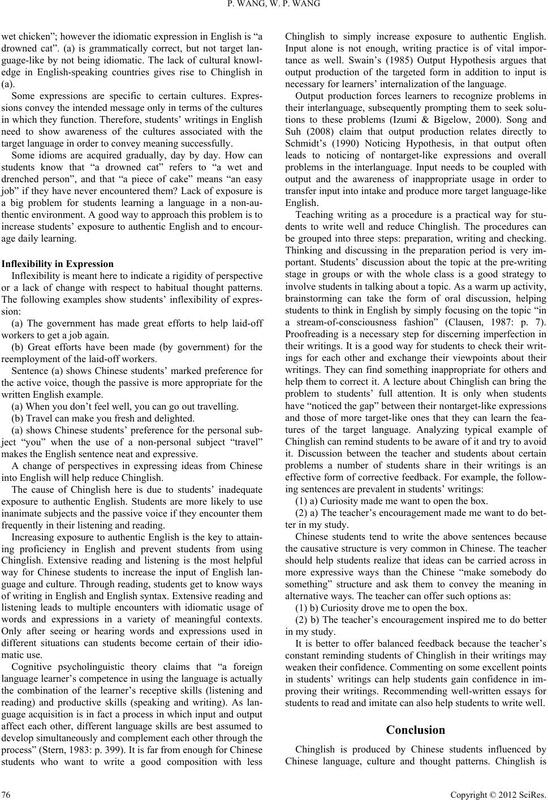 TESOL Quarterly, 42, 181-207. Shanghai Foreign Language Education Press. prehensible input and comprehensible output in its development. In S.
Gass, & C. Madden (Eds. ), Input in second language acquisition (pp. 235-253). Rowley, MA: Newbury House. dian Modern Language Review, 46, 178-194.
process. Journal of PLA University of Foreign Languages, 4, 64-76.
linguistic knowledge: A model of multiple-level discourse processing. Xiao, A., & Li, J. (2007). A course in English-Chinese translation. Chongqing: Chongqing Un iv e rsity Press. Sichuan College of Education, 11, 30-32.
sity of Science and Technology Publishing Press. jin Foreign Studies University, 4 , 58-60.